I recently came across an unexpected gem: this book titled “Design Principles for Process-driven Architectures Using Oracle BPM and SOA Suite 12c” by a collective of authors I know well and happily collaborate with: Torsten Winterberg, Mark Simpson, Guido Schmutz, Danilo Schmiedel, Hajo Normann, Sven Bernhardt, Matjaz B. Juric. In this book, the authors present a clear overview of why and how to automate business processes – in various ways. They discuss normative business processes – whose execution is predictable, frequently even straight through – and show how BPM(N) is a great means to implement those, leveraging BPM Suite 12c and SOA Suite 12c. Then they tame the unpredictable in Adaptive Case Management (ACM): dealing with the category of business processes that is not so much restricted to a predictable flow and in which professional users – knowledge workers – have to exercise control over the execution of the business process. The authors explain how adaptive case management is supported in Oracle BPM Suite 12c – using very clear language and some compelling examples. I truly appreciate the logical way the topics are presented in this book. Clear structure, historical background, some scientific references, introduction of relevant industry standards and many practical examples that show how challenges originate in the real world and solutions work in the real world. For most topics, the book provides patterns and reference architectures – that explain the general structure of solution architectures to address specific challenges and also map these to the latest Oracle products. Solution architects such as myself will gladly make use of this valuable material in our daily jobs. * Mobile and Multi Channel – a discussion of putting custom and mobile user interfaces to provide insight and interaction points for human users on top of and into business processes; the reference architecture provided for mobile applications is valuable, rich and very clear. * Event Processing – always a favorite topic of mine, this chapter provides a great introduction, overview and set of examples and guidelines for leveraging events and implementing an EDA (Event Driven Architecture). Many guidelines any organization will arrive at after lengthy discussions are available for free in this chapter. The conceptual architecture diagram is well thought out and very comprehensive. I am impressed! * Business Activity Monitoring – this chapter explains how process analytics can be gathered from BPEL and BPM processes and leveraged in BAM 12c to interpret and analyze, visualize and turn into action. The chapter does not discuss case analytics for ACM – which I can understand since as far as I know there is no current support in this area; I feel like the author could have mentioned this fact and preferably provide a work around suggestion. However, this is only a very mild suggestion, not a harsh criticism. The book uses the case of a car rental company (Rent Your Legacy Car) to illustrate various topics. Even though it does not delve into details – you will not find step by step instructions to implement the case – it does provide enough details to get a firm grasp of what the tooling can do for you as well as some indication of how to achieve that. It makes the book accessible to developers as well as architects looking for an overview and not necessarily every last little detail. The preface states the intended target audience: “This book is intended for BPM and SOA architects, analysts, developers, and project managers who are responsible for, or involved in, business process development, modeling, monitoring, or implementation of composite, process-oriented applications.” I can confirm that indeed this audience will benefit from reading this book. I can only congratulate the authors on their achievement: a seriously valuable and very readable book. Job well done, gentlemen! And to you as prospective reader I would like to enthusiastically and respectfully suggest that indeed you should read this book to grasp how Oracle Fusion Middleware 12c will help to design and realize process driven architecture with the potential for tremendous business value. Maarten Smeets (AMIS, The Netherlands) published a great blog article on how we can monitor ACM Cases by having the ACM Case publish EDN events. These EDN events end up on a JMS Topic where we can have BAM directly consume them. Alternatively we can have OEP work on these events or consume them into a SOA Composite that performs additional processing. Services exposed from the SOA Suite – whether they are implemented through Service Bus or SOA composites – can be exposed in various ways. The most common is the web service binding or transport that supports SOAP/XML calls over HTTP. We have discussed support for RESTful services, also over HTTP. And now we will look at exposing the service as an EJB over RMI. Both Service Bus composites – using the JEJB transport – and SOA composites – through the EJB adapter– can easily be exposed as EJBs. Consumers of these services interact with such EJBs like they do with regular EJBs – no specific SOA Suite aspects are involved. The onus of translating from the world of the Java interface and serialized Java objects to WSDL and XML is on the SOA Suite. Note: with the ever increasing support for web service interaction in Java – through for example JAX-WS and JAX-RS – the relevance of direct EJB interaction is somewhat decreasing. EJBs are primarily used when transaction and security scope are important. This online complement to chapter 6 describes how to expose both the AircraftMovementService Service Bus project and the AircraftMovementServiceSOAComposite through an EJB interface, next to their existing web service end-points. 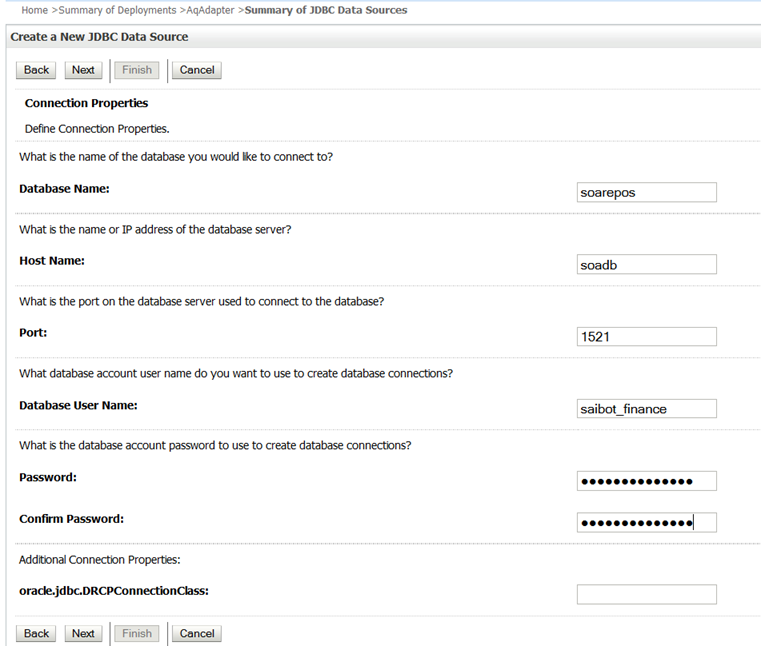 It introduces various inbound EJB interaction styles supported by the SOA Suite: inbound JEBJ Transport, the inbound EJB adapter and the direct binding facility. Exposing a Service Bus composite as an EJB is done by creating a proxy service that uses JEJB as its transport. The interface of such an JEJB proxy service is defined through a Java interface. That interface is the remote interface through which Java clients access the EJB and indirectly the Service Bus composite. From this interface, a WSDL equivalent can be generated that can be used as the interface for a pipeline that the proxy service is wired to. This pipeline – despite the WSDL interface – will receive the body variable containing a Java payload. If the pipeline routes to a business service that also uses the JEJB transport, then these Java objects never have to be marshalled into XML. However, for any other business service, the Java objects in the payload have to be turned into XML in a custom Java class that is called in a Java Callout activity. We will now expose the AircraftMovementService as an EJB using the JEJB transport. Create a deployment profile of type JAR file for the project. Next, deploy the project according to that profile, resulting in a simple JAR file in the deploy directory under the project root. This JAR file contains the interface and the bean definition. Right click in the Exposed Services lane and select Insert Transports | JEJB from the context menu, as shown in Figure 6-46. The wizard for configuring the proxy service appears. Set the Service Name to AircraftMovementServiceJEJB and the location to the Proxy folder. Do not generate the pipeline for this proxy service. Click Next. Set the Endpoint URI also to AircraftMovementServiceJEJB. Press Finish to have the proxy service created. Double click the generated proxy service to bring up the editor. Go to the Transport Details tab, shown in Figure 6-47. Ensure that the EJB Spec version is 3.0. Browse for the JAR file that was created during deployment in the previous step. Select the AircraftMovementReporter as the Business interface. Set the Target Namespace to saibot.airport.operations/monitoring. The selected interface contains a single method – reportAircraftActivity – that is preselected. Set the name of the input parameter to aircraftMovement. That is the name under which we can access the Java payload in the $body variable. Before we can create the pipeline that this proxy service is going to route to, we have to generate the WSDL that defines the interface for that pipeline. This WSDL can be derived from the Java interface exposed by the proxy service. 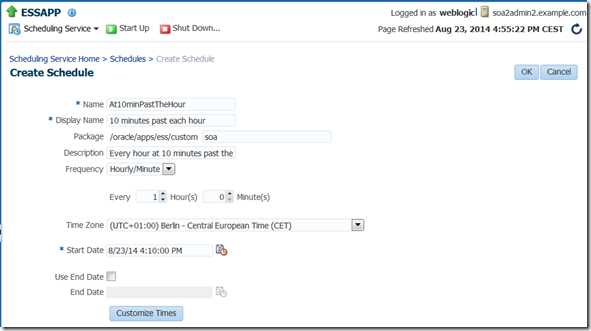 Right click the proxy service and from the context menu select Service Bus | Generate WSDL. Enter AircraftMovementServiceJEJB.wsdl as name for the WSDL to be generated and have it created in the WSDLs folder. Next we can create the pipeline, based on this WSDL. 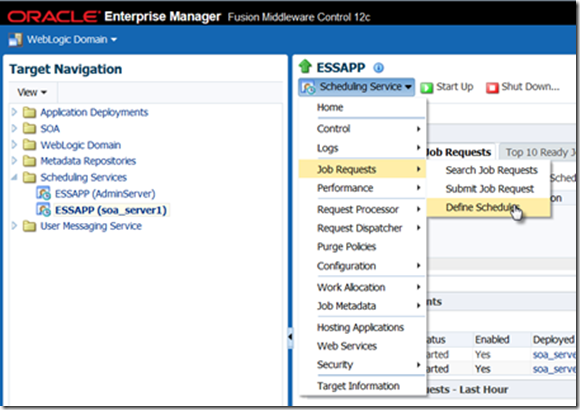 Right click the WSDL and select Service Bus | Generate pipeline. Call the pipeline AircraftMovementPipelineJEJB. Wire this pipeline to AircraftMovementPipeline. Also wire the proxy service AircraftMovementServiceJEJB to the AircraftMovementPipelineJEJB, as shown in Figure 6-48. Calls arriving at the EJB interface of this Service Bus project are routed to the AircraftMovementPipelineJEJB. Here, the Java object payload will have to be converted to XML. Subsequently the request is routed to the AircraftMovementPipeline. From then on, the processing is no different from calls arriving at the web service proxy. In order for this pipeline to be able to route to the AircraftMovementPipelineJEJB, the $body variable will have to contain the required XML data content rather than the Java object payload it currently has. The method for working with a payload consisting of Java objects is through the Java Callout activity. The Java Callout activity can be used in a pipeline to invoke a custom and static Java method. Multiple argument values can be passed in this call and a single value can be returned – usually a primitive, String or an XmlObject. In our case, the input to the Java method would be the AircraftMovement bean that constitutes the Java content in $body, as received through the EJB interface. We would like this method to return the XML equivalent of that bean as the AircraftMovementRequestMessage that is the input to the next pipeline. Variables in Service Pipelines – such as $body – are Java objects of type XmlObject (defined in the Apache XmlBeans library). This is relevant when entire variables are passed in the Java Callout as input parameters and of course for constructing return values that are to be assigned to variables such as $body. The Service Bus runtime ships with the Apache XmlBeans library. In order to develop a custom Java class that can work with XmlObject, we need to have access in our project to the JAR file for that library. Note: if the Java Callout returns a variable that is not a primitive, a String or an XmlObject, then a reference to the returned object is stored in the pipeline variable. This reference cannot be meaningfully manipulated through XML manipulation. However, when another Java Callout is made or a business service with JEJB or JMS transport is invoked, the underlying Java object is transferred. The JAR file that contains the required definitions for the XmlBeans library ships with the SOA Suite. It can be found as com.bea.core.xml.xmlbeans_1.0.0.0_2-6-0 under MIDDLEWARE_HOME/Oracle_Home/oracle_common/modules. Add this JAR file to the AircraftMovementService project. The Java class that is the target of a Java Callout has to expose one or more static methods. The class has to be packaged in a JAR file that will be deployed to the SOA Suite along with the Service Bus composite. Create Java class JavaPayloadDissector according to the source code shown below. Deploy the JAR Deployment Profile once more, to have this class added to the JAR file in the project’s deploy directory. Open the AircraftMovementPipelineJEJB pipeline. Add a Java Callout activity to the request pipeline. where mon is the prefix for the target namespace in the WSDL generated for the pipeline. Assign the return value from this Java Callout to a custom variable called aircraftMovementRequest. This variable will be set with the XmlObject constructed in the getReportAircraftMovementRequestMessage method. The $body variable has to be updated using the result from the Java Callout. Add a Replace activity to the request pipeline and insert it after the Java Callout, as in Figure 6-50. Set the Location to body and specify that the node contents should be replaced. The expression that specifies the value to be injected in the body variable is $aircraftMovementRequest (which contains the XmlObject created in the Java Callout). This completes the pipeline. At this point you can redeploy the Service Bus composite, for example by running one of the proxy services in the Service Bus composite overview. When you run a proxy service with a JEJB transport, the composite is deployed and the Service Bus tester appears but it does not actually allow you to invoke the EJB. To make such a call, you need to create a Java client. 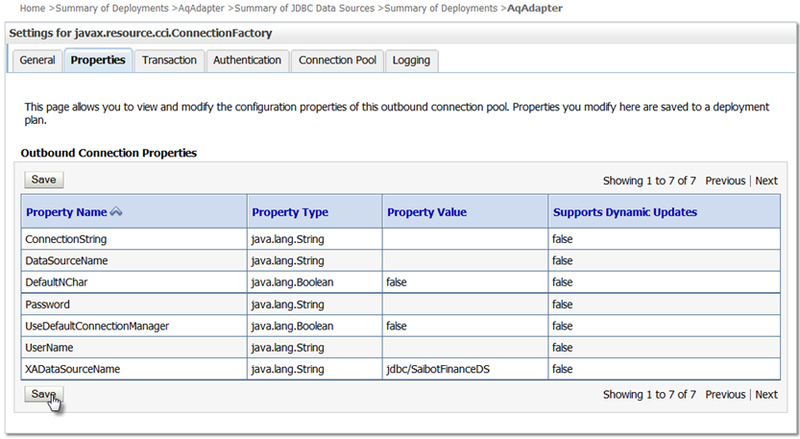 To verify whether the deployment succeeded, you can check the JNDI Tree in the WLS console. You can access this tree by clicking on the node Default Domain | Environment | Servers in the Domain Structure window, then clicking on the DefaultServer link and finally clicking on the View JNDI Tree link on the DefaultServer overview page. Figure 6-51 shows the EJB exposed by the Service Bus project. This also gives us the Binding Name we need to use in a Java client accessing this EJB endpoint. 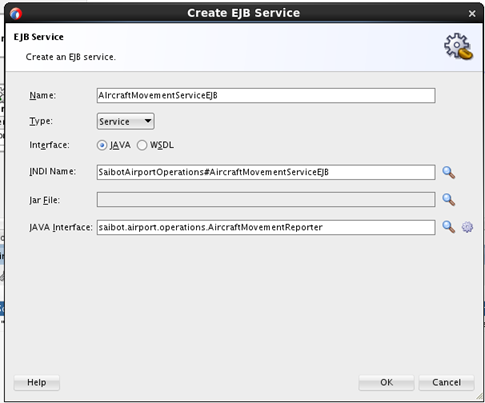 To invoke the EJB exposed by the AircraftMovementService composite, create a new Java project, called AircraftMovementServiceJEJBClient. 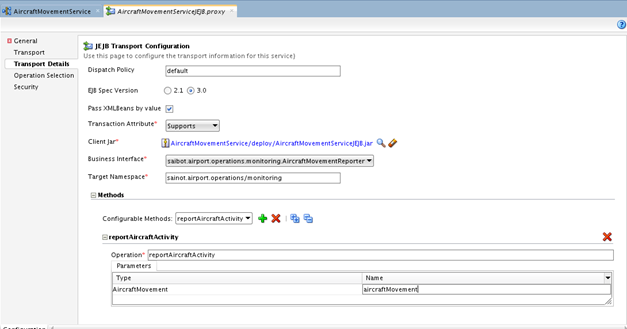 Add the WebLogic 12.1 Remote-Client library to this project and also the AircraftMovementServiceJEJB.jar in the deploy directory of the AircraftMovementService project. This JAR file contains the remote interface and the bean definition that our client will have to use. Then create a new class called AircraftMovementServiceEJBClient. The implementation for this class is shown below. Note how the JNDI binding name of the EJB is used in the lookup call. This is the linking pin between the client and the remote EJB. Run this class to make a call to the EJB. The final result should be that either a message is placed on the JMS queue or a call is made from the AircraftMovementService composite to the EJB exposed by the financial department. Whatever took place is of course entirely invisible to this client, just as it should be. The same EJB Adapter that we used earlier to create an outbound reference to an EJB to allow components in a SOA composite to invoke that EJB, can also be used to expose a SOA composite as an EJB. 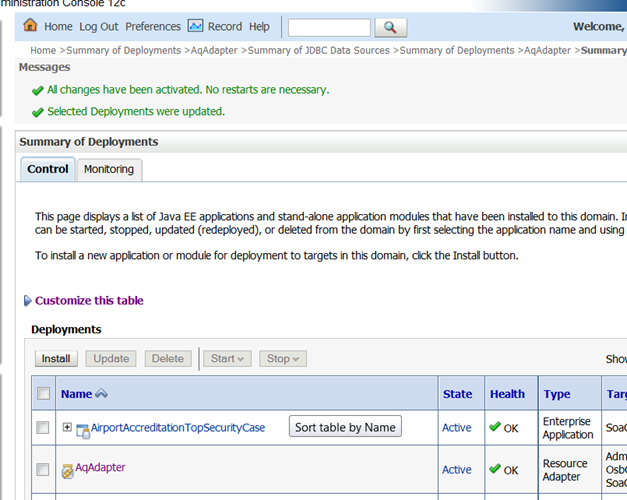 Using the EJB adapter in inbound mode it will register an EJB with the WebLogic Server with the Java interface specified during development. 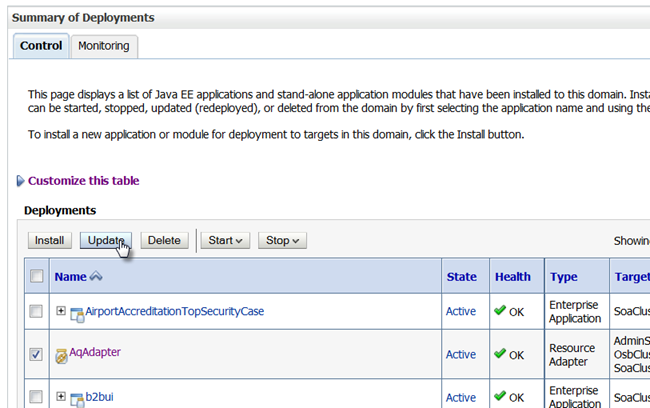 Java clients can invoke that EJB and in doing so enlist the help of the SOA composite. The steps to front the SOA composite with an EJB as entry point are straightforward: define the Java interface that describes the EJBs capabilities, add the inbound EJB adapter binding to the composite, based on that interface and wire the adapter binding to a component (typically a mediator) to link the worlds of EJB and Java on the one hand and WSDL and XML on the other. First: create the Java interface that the EJB should expose. 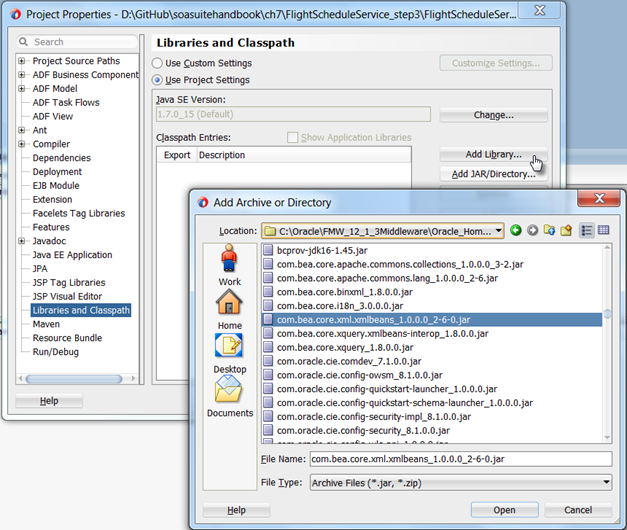 Typically, this Java interface is a close Java equivalent of the exposed web service – in this case the AircraftMovementService. Let’s call the interface AircraftMovementReporter in package saibot.airport.operations.aircraftmovement. Specify a single method that takes input parameters for timestamp, number of passengers, airport and aircraft code, airline, flightnumber and departure or arrival indicator. The method does not return a value. Drag the EJB Adapter to the Exposed Services swimlane. The configuration wizard appears. Specify the name of the service to AircraftMovementServiceEJB. Set the JNDI name to SaibotAirportOperations#AircraftMovementServiceEJB. 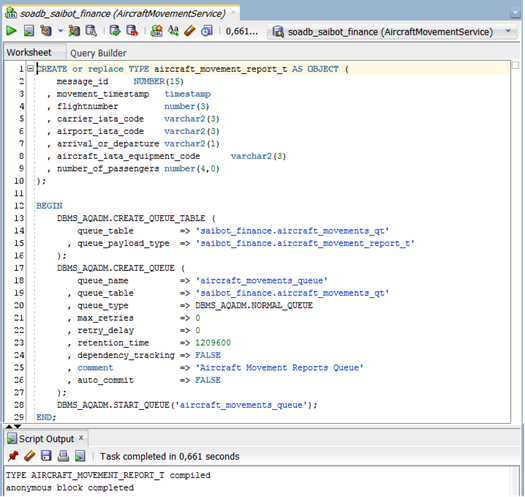 Select the Java interface AircraftMovementReporter that was just created. Note that if the interface definition had already been available in a JAR file in the project, we could have selected it as well. Additionally, the wizard allows the generation of a Java interface from a WSDL document. Press OK to complete the configuration. The EJB adapter binding is added to the composite.xml file and displayed in the composite overview. Create a new mediator component called AircraftMovementEJBtoAircraftMovementMediator to mediate between the exposed EJB interface and the AircraftMovementMediator that routes to the components that do the actual work. Wire the AircraftMovementServiceEJB to the new mediator AircraftMovementEJBtoAircraftMovementMediator, as is shown in the figure. Also wire this mediator to the AircraftMovementMediator. All that is left to do now is create an XSL Map for the transformation between the XSD generated for the Java interface and the reportAircraftMovementRequestType, and use that XSL Map in the AircraftMovementEJBtoAircraftMovementMediator. Wire the EJB Service to the AircraftMovementEJBtoAircraftMovementMediator mediator and that mediator to the AircraftMovementMediator that routes to the EJB reference binding. When the wires are added and the transformation through the XSL Map is configured, the composite can be deployed. 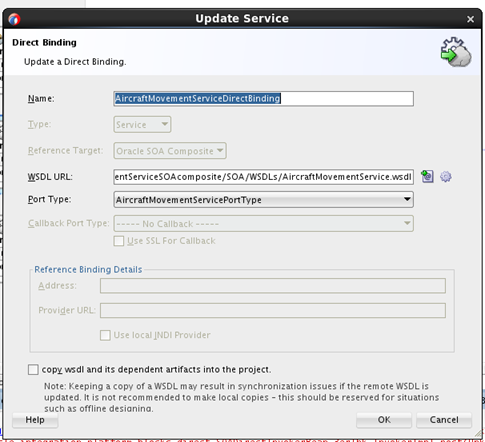 When the SOA composite has been deployed, a new EJB is published in WebLogic – AircraftMovementServiceEJB – that can be invoked by Java clients. The call to this EJB – that represents the SOA composite – is not any different from calls to ‘normal’ EJBs. 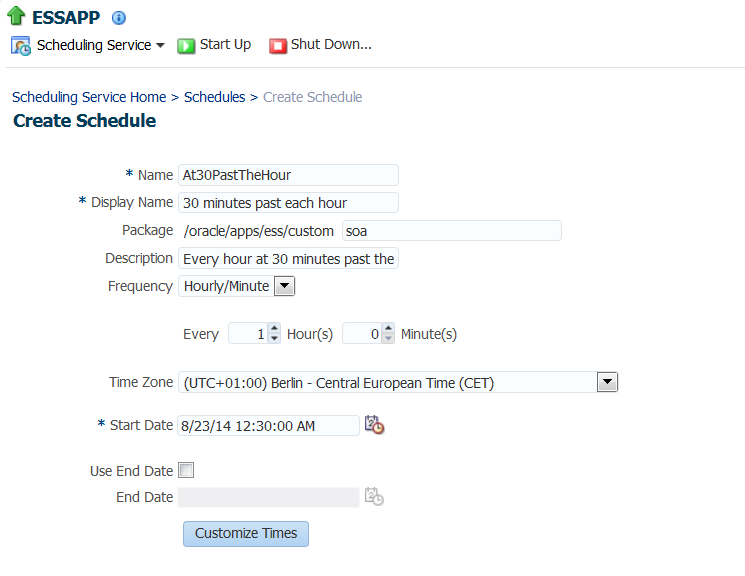 It does not require special SOA Suite run time libraries for the service consumer. In fact, the class AircraftMovementServiceEJBClient that was created to invoke the EJB exposed by the Service Bus composite can be reused (provided the same Java interface was implemented) with minimal changes to also invoke the EJB published by the SOA composite. Note that the binding name has to be modified. SOA composites can expose services through the direct binding API. Direct binding enables Java clients to directly invoke composite services over RMI, bypassing the need for a JAX-WS proxy required with the web service binding. Note that the client still communicates with the direct binding interface in terms of XML messages. The direct binding components support both synchronous and asynchronous invocation patterns. It also supports both inbound as well as outbound interactions. The latter is used to connect SOA composites and Service Bus services when they need security or transaction propagation, and that outweighs the increased coupling introduces with the direct binding. Although somewhat similar to interaction via the EJB adapter, the direct binding does not require a Java interface to be defined for the service to be invoked. A Java client does not interact through a service specific EJB, but accesses the generic Direct Binding Invocation API. The Java client needs to import a number of classes from runtime SOA Suite libraries that constitute this API. The Direct Binding Invocation API takes the JNDI connection parameters and creates a connection object on behalf of the client. This connection is to the destination SOA Suite server, as well as to the specific direct binding service exposed by a specific version of a specific SOA composite. Adding a direct binding interface to an existing SOA composite is dead simple. Drag the Direct [Binding] component from the component palette to the Exposed Services lane. Configuration of the direct binding service in the wizard that appears is simple: define the name of the service as AircraftMovementServiceDirectBinding and select the WSDL and Port Type that the service exposes – just as you would for a [SOAP] Web Service. In this case these are the AircraftMovementService.wsdl in the WSDLs folder and the AircraftMovementServicePortType. The exposed service is displayed in the composite overview, because the service element is added to the composite.xml. We can now wire the direct binding service to components such as the mediator in exactly the same way as we do for Web Service bindings. In such cases we expose the same service using several interfaces. The service consumer can then pick the interface that best suits its needs. Wire the direct binding service to the AircraftMovementMediator, as shown in the next figure. Requests coming in over the direct binding interface are handled in exactly the same way by the mediator as requests arriving over the SOAP Web Service interface. Invoking the direct binding interface is done from a Java class that uses a number of SOA Suite runtime libraries to make the connection (over RMI). A very simple Java application that invokes the AicraftMovementService over its direct binding interface can be created as follows. 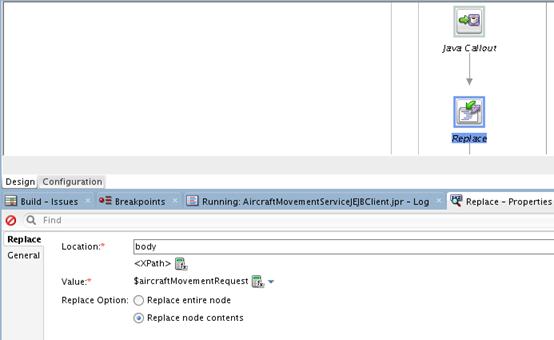 Create a new Java project in JDeveloper, for example called AircraftMovementServiceDirectBindingClient, with default package saibot.airport.operations.aircraftmovementservice.directbindingclient. 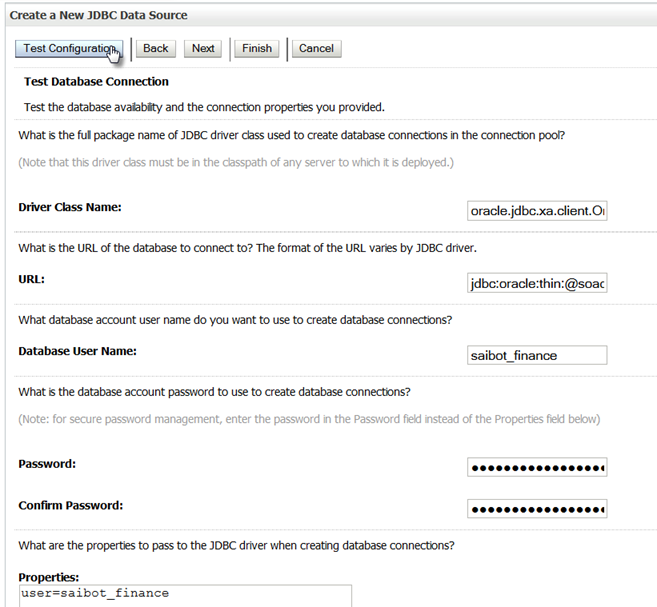 Add the libraries WebLogic 12.1 Remote-Client, Oracle XML Parser V2, JRF Runtime and SOA Runtime to the project – to make the classes available that are used when accessing the direct binding. Create a Java bean AircraftMovement in package saibot.airport.operations.aircraftmovementservice.directbindingclient – a simple POJO with these properties: movementTimestamp, flightNumber, carrierIataCode, airportIataCode, arrivalOrDeparture, aircraftIataEquipmentCode and numberOfPassengers. Generate the getters and setters for this bean. When this code is executed, the SOA composite is triggered via its direct binding interface – as is visible in the flow trace in the EM FMW Control. No response is received of course, because the interaction is still one-way. However, a message will have been published to the JMS queue, based on the contents of the AircraftMovement bean. 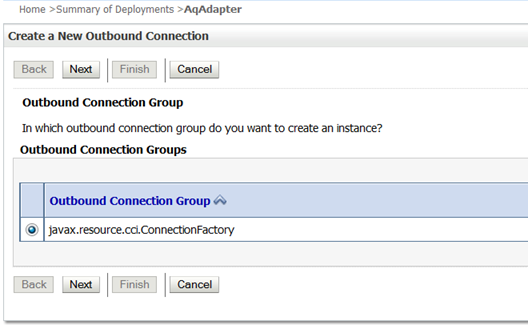 In Chapter 6, we introduce the AQ Adapter for outbound interaction with (i.e. publication to) an Advanced Queue in an Oracle Database. 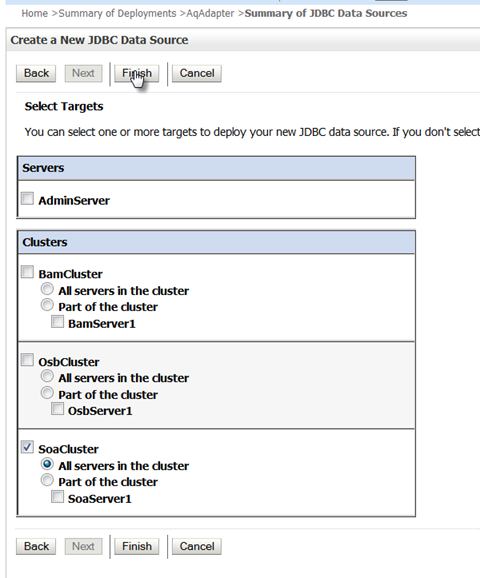 This article provides supporting details for the configuration of the AQ objects in the database as well as the WebLogic configuration of JDBC Data Source and AQ Adapter connection. This article is supported by another article about the preparation of the database for the Saibot Airport demo environment. 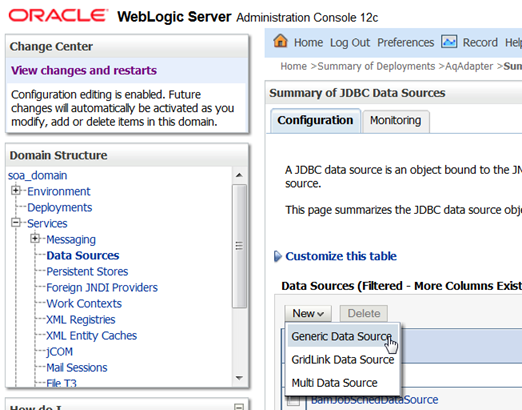 Configuring a JDBC data source is done in the WebLogic Admin Console. 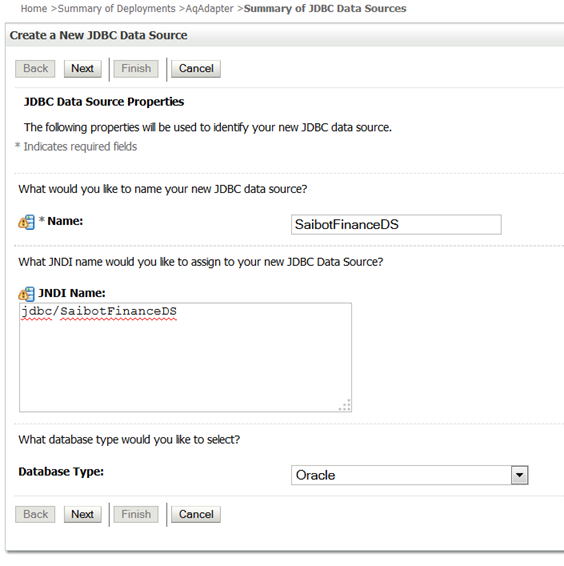 This data source should have a JNDI name set to jdbc/SaibotFinanceDS. 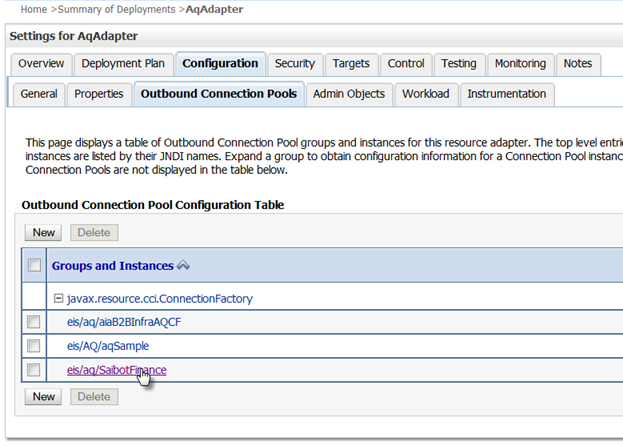 Find the AQ Adapter deployment in the summary of deployments. Click on this deployment to go to the Settings. Open the Configuration tab and within that the Outbound Connections Pool. Click on the New button, to create a new connection. Another two step wizard, in which you accept the default and only Outbound Connection Group on the first page and set the JNDI name for this new connection on the second page. This name will be referenced from the outbound Adapter binding in the service implementation. 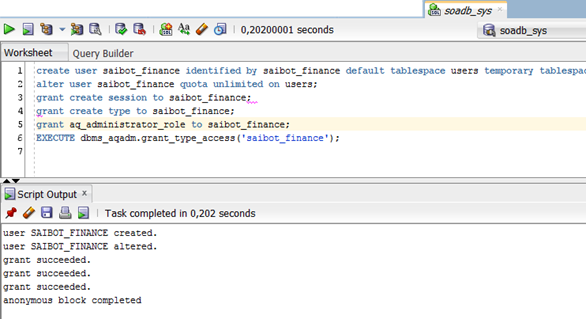 Set the name to eis/aq/SaibotFinance. Press Finish to complete the creation of the connection. 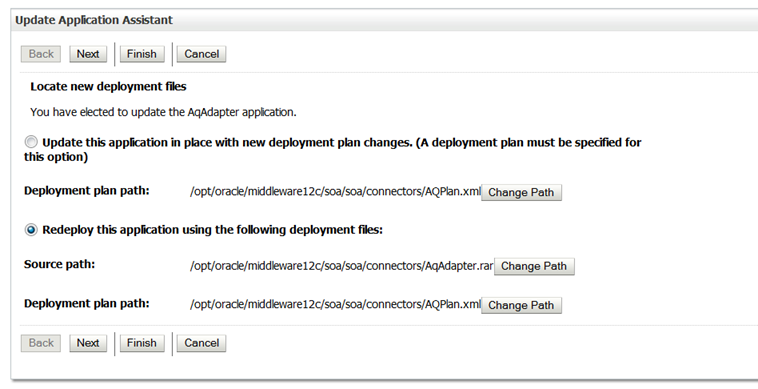 The Save Deployment Assistant may appear, to have these changes in the configuration of the AQ Adapter saved in a new deployment plan. Set the name of the plan to AQPlan.xml and press OK to have the plan saved. Next, return to the Properties tab for the connection. Press enter and press the Save button. 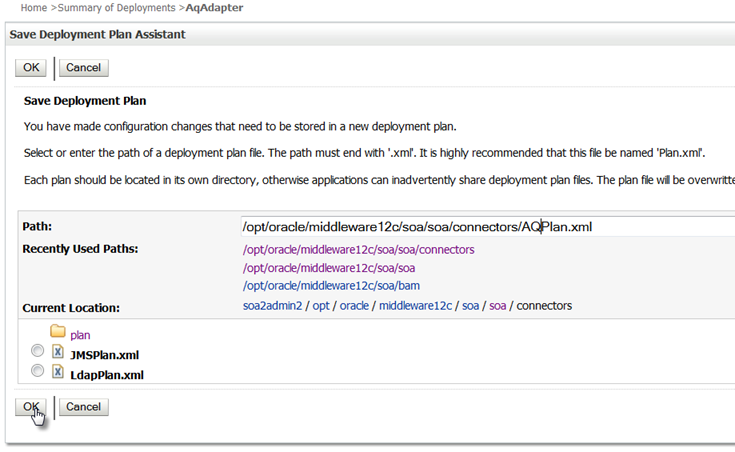 Now to ensure the new AQ Adapter connection is available for use, update the AqAdapter deployment, as shown in Figure 6-32. 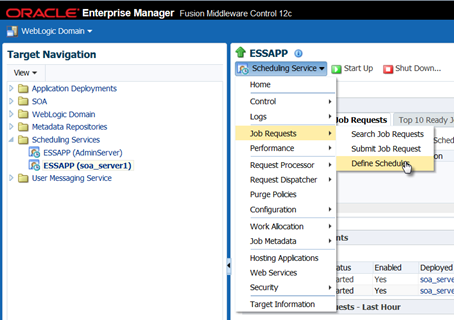 The Enterprise Scheduler Service that is available in Fusion Middleware 12.1.3 supports a number of administration activities around the SOA Suite. We will look at one particular use case regarding environment management using the ESS. Suppose we have an inbound database adapter. Suppose we have created the PortalSlotRequestProcessor SOA composite that uses a database poller looking for new records in a certain table PORTAL_SLOT_ALLOCATIONS (this example comes from the Oracle SOA Suite 12c Handbook, Oracle Press). The polling frequency was set to once every 20 seconds. And that polling goes on and on for as long as the SOA composite remains deployed and active. Imagine the situation where every day during a certain period, there is a substantial load on the SOA Suite, and we would prefer to reduce the resource usage from non-crucial processes. Further suppose that the slot allocation requests arriving from the portal are considered not urgent, for example because the business service level agreed with our account managers is that these requests have to be processed within 24 hours – rather than once every 20 seconds. We do not want to create a big batch, and whenever we can, we strive to implement straight through processing. But between 1 and 2 AM on every day, we would like to pause the inbound database adapter. 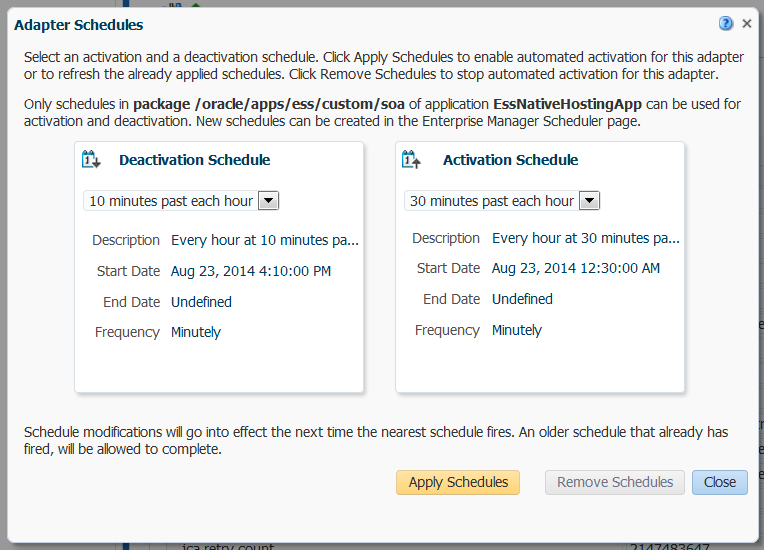 In this section, we will use the Enterprise Scheduler Service to achieve this. We will create the schedules that trigger at 1 AM every day, used for deactivating the adapter, and 2 AM, used for activating the adapter. In fact, in order to make testing more fun, we will use schedules that trigger at 10 past the hour and 30 past the hour. These schedules are then associated in the Enterprise Manager Fusion Middleware Control with the inbound database adapter binding PortalSlotRequestPoller. An ESS Schedule is used to describe either one or a series of moments in time. A schedule can be associated with one or many Job definitions to come to describe when those jobs should be executed. A recurring schedule has a frequency that describes how the moments in time are distributed over time. A recurring schedule can have a start time and an end time to specify the period during which the recurrence should take place. Click on the icon to create a new schedule. Specify the name of the schedule as At10minPastTheHour. Set the display name to “10 minutes past each hour”. The schedule has to be created in the package [/oracle/apps/ess/custom/]soa. 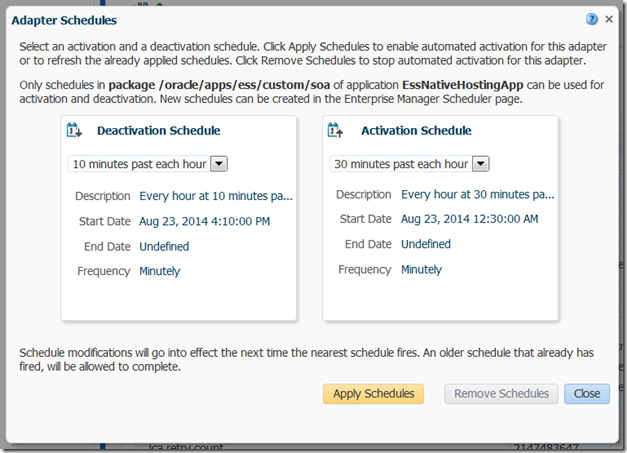 This is a requirement for schedules used for adapter activation. Select the frequency as Hourly/Minute, Every 1 Hour(s) 0 Minute(s) and the start date as any date not too far in the future (or even in the past) with a time set to 10 minutes past any hour. Note that using the button Customize Times, we can have a long list of moments in time generated and subsequently manually modify them if we have a need for some exceptions to the pattern. Click on OK to save this schedule. 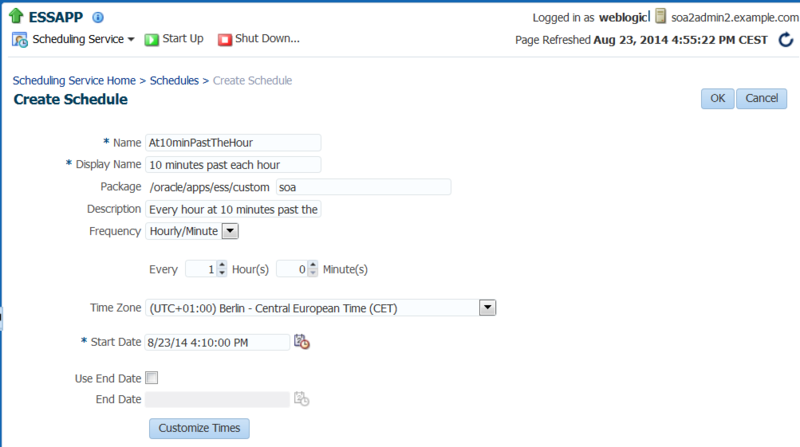 Create a second schedule called At30minPastTheHour. The definition is very similar to the previous one, except for the start time that should 30 minutes past some hour. Click OK to save this schedule definition. 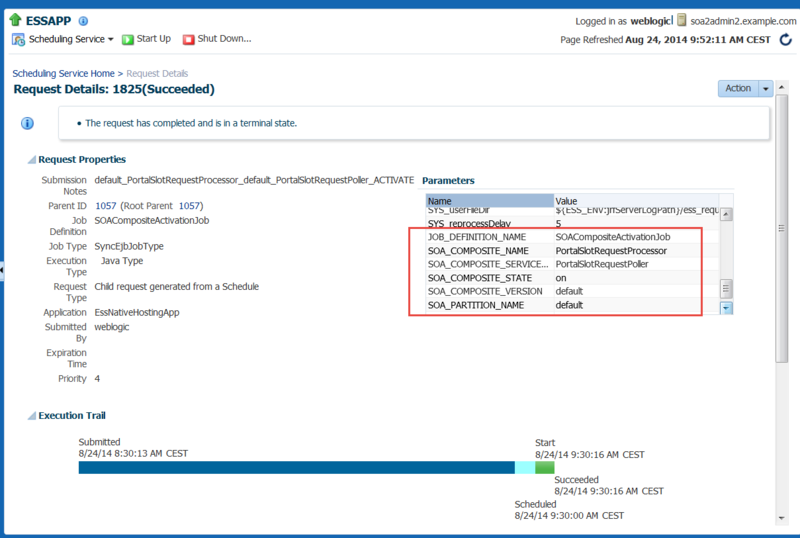 Note that more sophisticated recurrence schedules can be created through the Java API exposed by ESS as well as through the IDE support in JDeveloper. These options that allow specific week days or months to be included or excluded can currently not set set through the EM FMW Control. Select node SOA | soa-infra | default | PortalSlotRequestProcessor – the composite we created in the previous chapter. Under Services and References, click on the PortalSlotRequestPoller, the inbound database adapter binding. The PortalSlotRequestProcessor appears. Click on the icon for adapter schedules. In the Adapter Schedules popup that appears, we can select the schedule that is to be used for deactivating and for activating the adapter binding. Use the At10minPastTheHour schedule for deactivation and At30minPastTheHour for activation. Press Apply Schedules to confirm the new configuration. From this moment on, the inbound database adapter binding that polls table PORTAL_SLOT_ALLOCATIONS is active only for 40 minutes during every hour, starting at 30 minutes past the hour. For example, at 22:14, the binding is clearly not active. Here we see how a single record was processed by the adapter binding, insert at 10:09PM. Four more records were inserted into table PORTAL_SLOT_ALLOCATIONS at 10:13 and 10:14. However, because the adapter binding is currently not active, so these records have not yet been processed. At 30 minutes past the hour – 10:30 in this case – the adapter becomes active again and starts processing the records it will then find in the table. Because the adapter was configured to pass just a single record to a SOA composite and not process more than two records in a single transaction, it will take two polling cycles to process the four records that were inserted between 10:10 and 10:30. These figures illustrate this. In the Job Requests overview, instances of these jobs appear, every hour one of each. 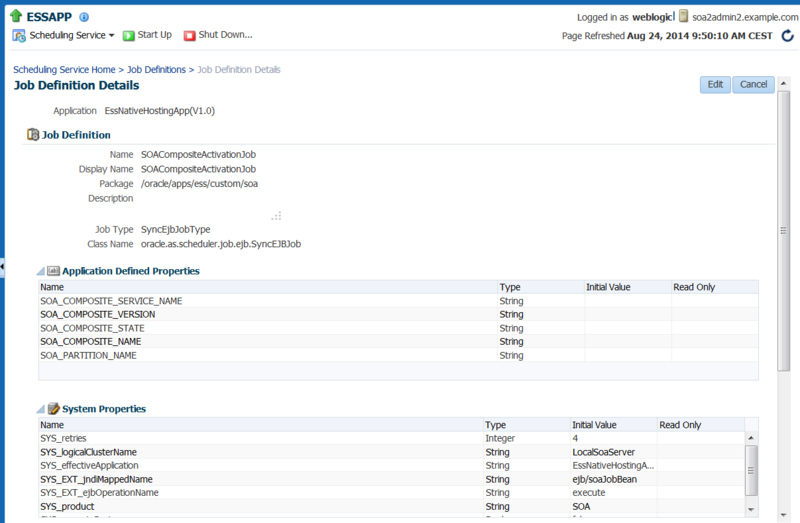 And the details of these job requests specify which adapter binding in which composite is the target of the SOA administrative action performed by the job. Chatting or instant messaging is a valuable for of communication, somewhere between email (very asynchronous) and telephone/Skype/VoiP/HangOut (synchronous) and quite similar to SMS. Unfortunately, there is has been an explosion in the number of IM protocols and services, many of which cannot talk to each other. Whatsapp is perhaps the most popular chat-like service, but it lives on its own. Google Talk (now assimilated into GMail and Google Hangouts) started as a relatively open service (based on the XMPP standard for IM), but is now largely proprietary. AOL, MSN, ICQ, Facebook, Skype, Twitter – many different largely closed networks within in which users can interact in char-style. But unfortunately hardly across which. Not like emails for example that float freely between domains, servers and vendor technologies. Having said all that, XMPP is still supported by many tools and servers – and it is still used by large numbers of users. Not just for chatting, but for other types of push-style interaction. See this Slideshare presentation for a nice intro into XMPP. Note that it mentions some attempts to create gateways to connect the worlds of XMPP, Skype, AOL/AIM, IRC. The goal of this article is not to commiserate over XMPP. It is to show you how SOA Suite can be configured to participate in XMPP based conversations – for now only as a sender of messages (we will discuss inbound integration with XMPP in a later article). In SOA Suite 12c, the functionality that was already available from the UMS (User Messaging Service) and the UMS Adapter in SOA Suite 11g has been continued and a little bit extended. I will show you what it looks like and how to make it to work.